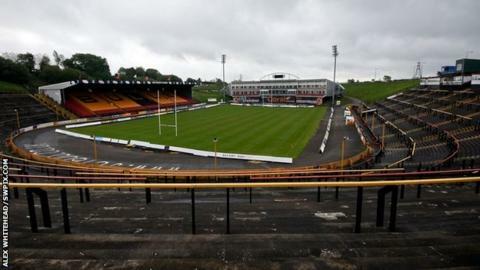 Relegated Super League side Bradford Bulls, who are to play this season in the Championship, have set up a dual-registration link with rising Championship One side Coventry Bears. Coventry will be allowed to use members of James Lowes' Bulls squad throughout the course of the 2015 season. The two clubs are also to continue working together on a commercial basis. Bulls officials have already helped the Midlands club since they arrived in rugby league's professional ranks. Founded in 1998, the Bears won their first amateur honour when they were crowned Western Division champions in 2000. They were granted permission to join the National Conference League two years ago, before being told last summer that they they would be competing in professional rugby league's third tier for the first time in 2015. They play out of the Butts Park Arena, which is shared by Coventry RFC. "These are exciting times for both clubs," said Bulls managing director Steve Ferres. "We want to help Coventry adapt to life outside the community game. "The club has been working extremely hard during the past two seasons, both commercially and in terms of recruitment, and we will aid that in any way we can. "They will have access to some of our players, which will prove mutually beneficial." Alan Robinson, managing director of the UK's newest professional side, said: "It has been fantastic for us to strike up a relationship with the Bulls, a club I have admired for many years. "There is already great synergy between our clubs. "I have begun to develop a great relationship with both Steve Ferres and Marc Green off the field while Tom Tsang, our head coach, has been working with James Lowes on it."